The first coastal wind farm in the United States-Community Energy's successful Jersey-Atlantic project-could be the benchmark for further coastal, and perhaps off-shore, projects. There's a great deal of gambling going on in the casinos of Atlantic City, not too far from the five turbines that make up the relatively new Jersey-Atlantic Wind Farm. The $12 million wind farm itself--New Jersey's first and the first coastal wind farm in the United States--was no gamble, however, and is now successfully producing 7.5 megawatts, and supplying emission-free electricity to over 2,500 homes. Added to that, the wind farm's largest customer for power is located right on the site, in the form of a wastewater treatment facility. A further alternative energy feature is the treatment facility also has a 500-kilowatt solar project, the second largest in the state. "The project has a lot of unique aspects to it," says Brent Alderfer, president of Community Energy Inc., the developer and co-owner of the Jersey-Atlantic wind project. What initially drew Community Energy to the project were the coastal winds coming off the Atlantic in this particular location, and the timing of those winds. "There is a lot of energy-generating wind along the coast and it comes in at the time of day when it is most valuable, in the early afternoon, and it blows until sundown," explains Alderfer. "That's the perfect coincident peak for power demand in the summer." Jersey-Atlantic actually marks Community Energy's first project on any coast. The company markets power from about 20 inland wind farms in its home state of Pennsylvania as well as Illinois, West Virginia, New Hampshire and New York. In addition to exclusively marketing the output from a number of projects that the company did not have a role in developing, it has developed projects in Pennsylvania, Illinois, New Jersey, and has projects in the development pipeline in another 15 states, including New York, New Hampshire, Illinois, Iowa, Texas and Colorado. The company has over four billion kilowatt-hours of wind energy sales, and marketing arrangements with 18 investor-owned and municipal utilities. That's likely to grow, with the company recently being purchased by Iberdrola, the world's largest wind energy company (see story at end). The east coast of the United States, both because of the company's area of operations, and the huge potential for wind generating facilities, seemed like a logical fit for Community Energy. "We had been looking for a site where we could get started with a coastal wind farm," says Alderfer. "The Jersey-Atlantic project is a small first step, but it proves that all the pieces--coastal wind as a good resource, support from the community, support from the utility--are all there." The company's thought was to locate a coastal wind farm on an already occupied, industrial site. The Atlantic County Utilities Authority wastewater treatment facility seemed to be a good fit. It was located just a mile inland from the coast, giving it plenty of exposure to the winds. It also had a "host" facility, in the form of the treatment plant that would use a lot of the wind energy generated. And there was high interest from the state. The New Jersey Board of Public Utilities (BPU) provided a $3.5 million rebate toward the wind farm. "It's not as large a project as some of the newer wind projects going up around the country, but we were looking to develop in New Jersey and build a high profile example of wind power in a state that is looking to do a lot in renewable energy," says Paul Copleman, sales and marketing operations manager for Community Energy. New Jersey currently gets less than one percent of its electricity from alternative sources, such as wind and solar. But the BPU has set a goal of four percent by 2008. There has also been good support for the Jersey-Atlantic project within the community. "It really has been amazing to see the pride the people of Atlantic City have in the wind farm," says Copleman. "People talk about it as kind of a tourist attraction and see it as an icon of forward thinking--and beautiful--energy technology." The five 380-foot wind turbines can be easily seen from the famed Atlantic City boardwalk. avoiding turbulence and meet warranty requirements. "The spacing was tricky." Even though the wastewater treatment facility sits on a 50-acre site, there's a limited amount of open space. Five turbines was the maximum that could be located on the site, given site limitations and the wind resource. The wind towers have a small footprint once they are in the ground, but Community Energy engineers and construction workers had to work around the wastewater treatment facility itself, an incinerator, maintenance buildings, parking lots--in other words, all the infrastructure of a municipal water treatment facility. "Understandably, everything on that site was set up to accommodate a wastewater treatment facility, not a wind farm," says Copleman. "The project could not have been done without the enthusiasm and full support of the Atlantic County Utilities Authority." Then there was the 500-kilowatt solar power system, with its PV panels going on buildings and over the parking lots. "All this was going on at the same time--it was a busy, and exciting, couple of months," says Alderfer. The solar power system was built by Alternity Power, a division of the Conti Group. The contractor on the Jersey-Atlantic project was M. A. Mortenson Company, one of the companies on Community Energy's well-developed, and growing, list of contractors. GE ably supplied the turbines for Jersey-Atlantic, though Copleman notes that Community Energy deals with a number of suppliers for the turbines for its projects. The foundation work for the towers was markedly different from, say, the bedrock a wind farm in a mountainous area would have. "But there were experienced foundation engineers who had been involved in building the Atlantic City casinos and they knew how to anchor foundations along the coast, with concrete piling driven 70 to 80 feet deep in the sand," says Alderfer. "This kind of foundation had not been used before on U.S. wind farms." There was a strong focus on the engineering, to ensure there was more than ample strength in the foundations and the tower structures. "We had to consider the potential for hurricane-force winds, so it was a bit different from the inland wind farms designs we had done in the past." Though it may have involved a bit more planning and construction work on their part, clearly the Jersey-Atlantic project has been a high profile success for Community Energy. As Alderfer notes, in addition to being the pioneer project on the coast, it has all the elements the company generally looks for in a wind power project. "The wind resource of course has to be there for each project, and the interconnection capabilities. And the market for the power has to be there, who is going to use the power and at what price. In addition to the wind farm, a further alternative energy feature on the treatment facility site is a 500-kilowatt solar project, the second largest in New Jersey. And finally there is permitting, which encompasses the community acceptance that is required to make sure the project can eventually get built." Community Energy has proven to be very effective at developing markets for wind derived energy. "Through the programs we have with the utilities, we have developed large corporate, institutional and university customers across the country, giving them the advantage of clean wind power," says Copleman. Customers include Fortune 1000 companies, Johnson & Johnson for example, and major universities, such as Carnegie Mellon, Penn State and NYU. "We now have over 30 colleges and universities in Pennsylvania alone." Rather than simply buying RECs, customers are interested in seeing their energy dollars going more directly to building alternative energy projects, Copleman says. "We are in a unique position to talk with customers about how their purchases are directly building new wind farms. When they make an agreement with us, they want to know that it is putting cement and steel into the ground--it's not simply trading credits with a broker. "The Chicago Climate Exchange has its own benefits and advantages, but our strength is in bringing new demand to wind farm development, and building wind farms." They have even branded their energy product, calling it "New Wind Energy," and have an Adopt a Windmill program. Developing the market through these innovative initiatives is crucial, says Copleman. "We continue to work hard to be a leader on the market side of wind energy because that is what it takes to bring these projects on in the early stages of this industry. The wind power market is still being established, and we need to create the uptake value for the buyer of wind power." A little more than a year into its operation, the Jersey-Atlantic wind farm is working well. Community Energy anticipated that about half of the system's power would be used for the wastewater treatment plant, and it has worked out to be slightly more than that. About 20 million kilowatt hours of electricity is supplied to the plant. The balance goes into the regional power grid. Power customers can then choose to purchase wind energy generated by the Jersey-Atlantic wind farm under the recently launched New Jersey CleanPower Choice Program, sponsored by the New Jersey Board of Public Utilities. Looking back, Alderfer says Jersey-Atlantic was one of the more demanding projects Community Energy has ever undertaken, in terms of specifications, economics and achieving community acceptance. "Extra effort was required in all these areas." 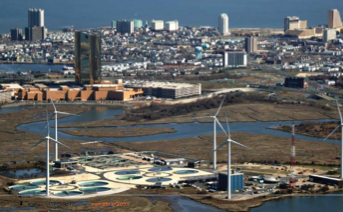 The fact that residents of Atlantic City now view the Jersey-Atlantic wind farm as a symbol of progress shows the degree to which the project has been accepted, says Alderfer. It could also open the door to further coastal wind farms and even offshore wind farms. "Jersey-Atlantic is a commonsense first step to harnessing the coastal winds and it has worked out for everyone," he says. "There's now a lot more acceptance in New Jersey to exploring options for offshore wind farms near Atlantic City because we've now done the first on-shore wind farm." And bigger picture, Alderfer notes, these projects all contribute to America's energy independence. "It's a start towards energy independence--we're harnessing free fuel right here in the U.S. Generating electricity with free fuel is a bet on the future that everyone wins. Wind projects offer price certainty, stability in volatile fuel markets and, related to climate change, are a step towards clean energy." That said, Alderfer notes that there is still a bit of an information process they go through on wind power with new utility partners. This is only logical, since the technology can be brand new to the utilities. "But once we outline the benefits and how the project can play out for them economically over the 10 or 15 years of a contract, and the advantages of wind power, everyone loves it." "Without overstating it, all utilities could benefit from wind power projects. Given that we can bring the capital, and then combine the marketing side, we can develop a solution for them." 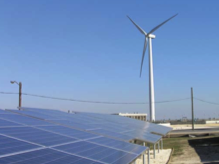 Community Energy is now part of a worldwide alternative energy concern with the company having been acquired by windpower giant Iberdrola in May, 2006. Having access to the resources of a large parent company will help Community Energy on a number of fronts, says company president Brent Alderfer. "We're now part of a large wind developer that has sourcing of capital and equipment around the world," he says. "That will really help us move ahead on projects without waiting on capital or equipment constraints." Within six months of being acquired by Iberdrola, the company brought on a wind farm in Pennsylvania, and the synergy benefits were visible. "We were pleased with the advantages of bringing that European and worldwide expertise to building that project. "Somebody like Iberdrola who has done 4,000 megawatts of wind power has a lot to bring to the table, and it shows in every aspect from turbine specifications right through to wind farm maintenance." As Alderfer notes, Iberdrola also has tremendous capital capabilities. The capital required to expand the North American wind power industry in the years ahead easily amounts to billions of dollars. Community Energy now has added capital capabilities behind it, providing further assurance to their utility customers/partners and component suppliers, says Alderfer. Being part of a bigger business concern means the buying decisions are bigger, as well. This past October, Iberdrola signed a $3 billion deal with Spain's Gamesa Corporación Tecnológica for wind turbines to power 2,700 MW, reportedly the biggest sale of wind power equipment to date worldwide.